Lytham Road in Freckleton was closed off for three hours as the fire and ambulance services attended the incident. An emergency incident in Freckleton which was believed to have been a 'suspect white powder' turned out to be tiling grout which had been sent to the wrong person. The incident happened yesterday at 7pm at a property on the junction of Clitheroes Lane and Lytham Road which resulted in a three hour road closure and cordon. Buses were also unable to access the village. The house on Clitheroes Lane believed to be where the package was sent. The parcel is believed to have been sent to the wrong person who contacted the emergency services. Freckleton Parish councillor Noreen Griffiths was working in the SPAR shop when the fire and ambulance services arrived. The 55-year-old who lives on Memory Close said: "They shut the whole road off and there was fire engines and an ambulance. When we came out to look they told us to get back into the shop. "We were a bit worried because you start thinking about things that have been in the news such as the Novichok poisoning and bomb threats. "Luckily it turned out to just be a mix up. A fireman told us at the end when they were packing up that it was tiling grout and they had managed to get hold of the guy who had sent the package because the guy knew who he was as he was expecting him to return a package. "It was quite enlightening in how they would deal with something like that and especially in a quiet village like Freckleton." Barbara Adams, 90, also lives on Memory Close and said she noticed the ambulance as she was closing her curtains. She said: "I thought something had happened in the shop because the ambulance was parked outside it. It was there for a few hours. "I never saw any police officers though. I was curious what was happening and there was a number of other people watching as well. The road was closed and no one could go near the scene." A spokesman from Lancashire Fire and Rescue Service said: "When crews arrived at the scene a number of tests were carried out on the white powder which resulted in it being identified as tiling grout." 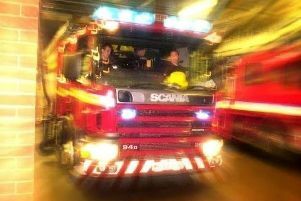 Two crews from Lytham and Wesham attended the incident after receiving a call shortly before 7pm. A Lancashire Police spokesman said: "We were called around 6.45pm yesterday following reports of a suspicious package. "It was reported the package contained some powder. The fire service was made aware and later attended the property."